Posted: Mon 04 Jul, 2011 12:13 am Post subject: THE WINNER: Birthday Bash! We just finished our Birthday Bash contest! 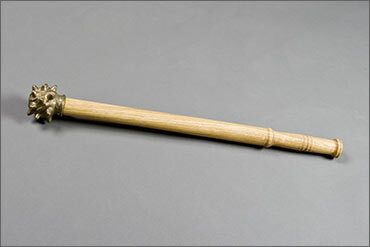 This contest has a bronze-headed mace offered up as a prize by Tod from The English Cutler! Mike Capanelli wins the prize!! Take a second and give your congratulations to Mike and please thank Leo Todeschini of The English Cutler for giving us this prize. Thanks to Tod and the myArmoury team for the contest! Congrats Mike, thats a nice mace you've won there, and as it's made by Tod you can be assured that its a good quality skull cracker. Congratulation Mike and I'm sort of relieved that somebody else won because I already won a Baselard dagger from Tod a while back and it's good for the " goodies " to get spread around more widely. Looks like a really nice mace head and looking forward to your hands on impressions of it: A large melon or pumpkin should meet a tragic end so that we can have a nice squishy report about the results. Tod does really good work as Stephen wrote in his post and these early maces are lighter but very fast in recovery compared to later maces. Nice going Mike. It couldn't have happened to a nicer guy. Enjoy! Congratulations Mike! I'm sure you'll have a lot of fun with your new toy! Thanks to Tod for his generosity, and to the myArmoury team for keeping this awesome site going! Congrats, don't forget to write a review of it. Grats to Mike and thanks to Leo! It's fun to be a part of a community like this and good to see good things happen because of community generosity. Thank you Leo and Nathan for the cool mace. What a cool thing to sign in to. I was just looking at these nit two days ago. Thanks again for the neat prize and I'll be sure to post picture as soon as I can. Now I'm off to find an evil watermelon that will meet it's end in my backyard. Well done Mike, I hope you enjoy it. 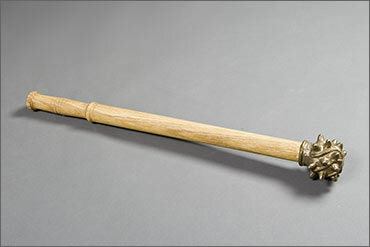 Personally I love this mace. I first saw it in an Osprey book several years ago and finally made a master for it last summer I think (or maybe the one before). It is a real honour this job in that I can just see an item and decide to make it and then look for the customers so I can on accassion really indulge myself and this was one of those pieces. Happy very belated Birthday Nathan, and I second the thoughts of those who thank you for making this site available for us all. A great resource and interesting place to hang out. And Happy Birthday to Nathan! Congrats, Mike, you've just won the smashing prize of the year Now put it to good use and give this watermelon of hell what it deserves! Please do share your thoughts and photographs so the rest of us can drool a bit more. ... Now I'm off to find an evil watermelon that will meet it's end in my backyard. Be careful, they can be sneaky and you might find yourself fending off a dozen or more! Congrats Mike! What a cool mace to win. Have fun smahing up those watermelons but look out for the pumpkins! Congrats, Mike. Met you at the NYC Knife Show a few years back, couldn't have gone to a nicer guys! Thanks for chiming in. It's funny, these maces never really appealed to me when I saw them published in books or even after seeing your creations. That is, until it arrived here and I got it in my hands. Once that happened, things "clicked" and I realized that these small-headed maces are little badasses. The amount of concentrated power that they can deliver to such a small area is pretty impressive and they're attractive to boot. You've won me over on these things. The box got shipped today, Mike.